Are you also an owner of a website who keeps listening about internal links on your website but are still unaware of what it all means and, at this point, you’re too embarrassed to ask? Then you’ve come to the right place, because in this article we’re going to cover why it’s important to use internal linking and how to actually use it. Namely, internal links ensure the transfer of the link’s authority from other websites to yours. Here, your task is to include at least two internal links on every important page and repeat it regularly. This article is going to focus on a very simple and useful, but too often overlooked SEO tactic, which is also useful from the point of view of user experience – we’re talking about internal linking on a website. These are the types of advice that everyone with an online presence should follow, regardless of whether you have an eCommerce store, demo site, blog or something else. This is how internal linking should look in practice. Internal links make up a large part of the optimization of websites and online shops. When talking about linking, most people only think about backlinks – the links from other websites to yours. Even though these links are extremely important, they aren’t the only ones that contribute to better positions of your site in search engines. In order for external links to be as effective as possible, we need to enable the so-called link juice a simple flow on your website, which can also be done with the links inside your website. The greatest number of links from other sites comes to our homepage, while other pages only get a few of those links. 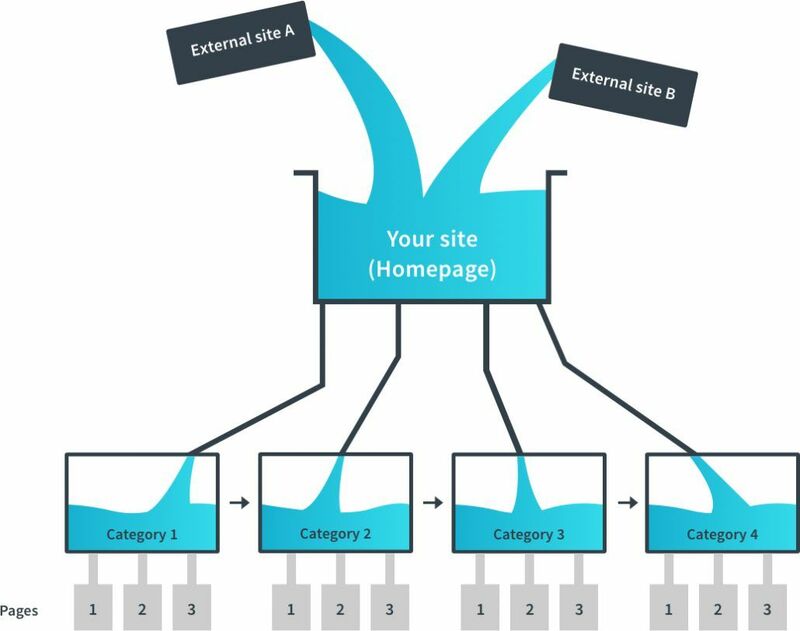 By using internal linking, we enable the link juice to flow into deeper levels of our website. Internal links on a website are completely ordinary links in the content that link to another, for a specific text or word relevant subpage. If we were in the category of “bikes”, where we had the offer of all the bikes on that website, with a further categorization of “mountain bikes”, “road bikes”, “electric bikes”, etc., we would need to include the links to some of these categories into the description of the main category. 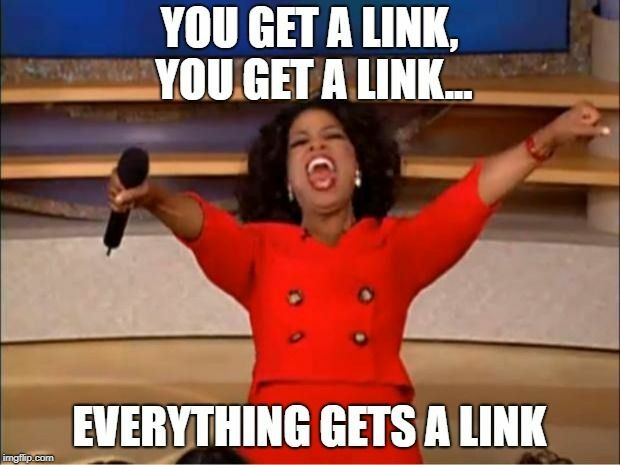 A representation of the link juice flow from other websites to yours. The phrase itself describes the process of linking various levels of our website and the internal links enable a more efficient flow of the link’s authority from other websites to ours. This principle applies to online shops as well as ordinary demo websites. With a well-thought-out use of internal links, we not only enable a better flow of the authority of external links, we can also effectively navigate the user on our website. With anchor texts (the blue text of a link) we can show our user additional relevant content and try to redirect them to it. Reverse links from other sites are one of the more important factors of off-site optimization. As mentioned before, it is important to enable an efficient flow of the authority of these links when optimizing our website. If, for example, one of the categories in our online shop includes 100 links from external sources, all the links from that category (the products, internal links in the category description, etc.) will get a part of the link juice of those 100 links. This same principle can also be found on a landing subpage of a demo site or a blog post. Web crawlers don’t care much for badly interlinked websites. In the first paragraph we mentioned that we can more efficiently guide our website user to content relevant to them, which is also reflected in a higher number of pageviews and a lower bounce rate. Google highly praises both metrics, so we kill two birds with one stone. The so-called web crawlers are search engines’ tools that make sure Google can easily read your content. Crawlers don’t have any problems passing through small pages. The problems are more common with more complex sites. With regular use of internal links, we enable the crawlers to efficiently pass through the website and to easily index the site. By using internal links we also hint to the crawlers which content is similar to the one where they’re currently located. When adding internal links, act as if Google doesn’t take into account the menu on your website. Prepare content with an added value for your user. Don’t saturate your content with internal links. Here, the golden rule is: longer texts can have a higher number of internal links. 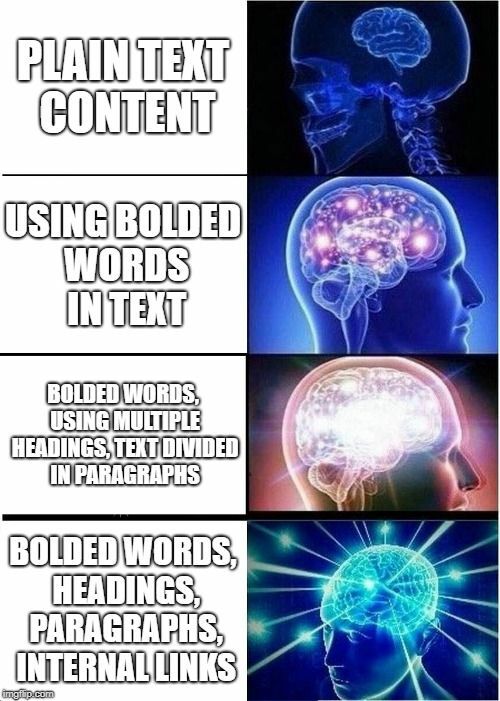 If you have a text with 200 words, it’s not recommended to use e.g. 10 internal links. Anchor texts of the internal link should be descriptive and relevant; using common phrases such as “click here” or “on this link” should be avoided. Anchor texts shouldn’t be too long. Anchor texts shouldn’t be too optimized. Let’s take the phrase “headphones for running”, for example. All internal links to the target subpage for this product shouldn’t be named “headphones for running”, you should try using phrases such as “running headphones”, “wireless headphones for running”, “sports headphones” and so on. Make sure you update old content with internal links to new content and vice versa. Add links only when it’s logical and when it creates an added value for the anchor text by using a word or phrase that best describes the content where you’ll link to (it can be a product, a category or something else). Content on your website that is user friendly and SEO appropriate. Try testing your new knowledge on your website; take a test period of one month and observe what happens. There are of course no guarantees but with a smart way of internal linking and by using the appropriate anchor texts you’re on the right path to improving your positions. And if you encounter any difficulties on the way, you are more than welcome to join us for a cup of coffee in Škofja Loka and we’ll find a solution together! Keeping up to date with the novelties in the field of SEO is crucial and I’m well aware of it. I can offer you the last news from the world of SEO and I make sure that your websites reach the highest positions in search engines.